Hi... I’m Jimmy, and my mission is to improve your life by making it happier everyday. Since my goal is to help make people happier, however, it is best to get the book to achieve maximum benefit from the plan (yes, that’s partly a sales pitch—but it’s true). 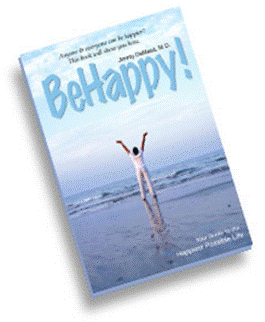 MY GUARANTEE TO YOU: While most of the information here at behappy101.com is free, we want you to BeHappy! with anything you purchase on this site; our reputation depends on it. Nothing is more important to me personally than for you to be completely satisfied with the information you receive. So if you are not satisfied with anything you buy on this site, for any reason whatsoever, simply contact me and I will have a refund check cut and sent to you immediately. It’s not easy for many people to be grateful right now. Our world is going through a difficult period. And some people believe it may get worse over the next couple of years before it starts getting better (some – like Harry Dent, author of The Great Depression Ahead - predict it will be around 2014 before we start to see a more positive economic and geo-political environment). That’s a long time for people to be “in pain”. And I think most people are feeling it to some degree. I know we are. The effects of the economy and the media representation of world and local events contributes to a general sense of anxiety, despair, and danger. So how can we be grateful? How can we see the “silver lining” when people are losing their jobs, their homes, their lives, and their “freedom” everyday? In my book (BeHappy!) and on my website (www.behappy101.com) I provide many answers to these questions – and strategies to deal with them. Regarding gratitude, it starts with focus. There are many well-known, and true, quotes about this. “We are what we think about”, “What we think about determines how we feel”, and “Our thoughts are our reality” are just a few. Consider for a minute how you would feel if everyday when you woke up, you started thinking about everything that is “wrong” with your life (maybe you already do this, so you know exactly how bad it feels). And we all have things in our lives that aren’t the way we want them. So, as soon as you wake up, you think about the bills that are late, the car that isn’t working very well right now, the job you don’t like, the disagreements you’re having with your spouse, and the house that’s too small for your growing family. How would that affect your day? Although I don’t watch the news – it’s tough to avoid the onslaught of bad news we are bombarded with everyday. And, just this week in the news was a story you probably heard about. It’s the story about the Air France plane that crash over the Atlantic Ocean, killing all 228 people on board. What a terrible tragedy. And, although there is very little reason I even need to know about this – especially since my entire family flies every couple of weeks – the only good thing I can find in knowing this information is that it makes me feel so grateful for not being one of those people – or even the family of those people. Think about it. How traumatic would that be? How terrible would it be to be one of the people in that plane? So, be grateful for being able to read this newsletter today! Now, consider how different you would feel if the first thoughts you had every morning were: how lucky you are to be alive, how fortunate you are to have your home (in contrast to the millions who are losing theirs right now). Or if you have lost your home, think of how great it is that you are not terminally ill. And if you have a job right now – any job – be grateful!! Many people have lost or will lose their job in the current economy. And if you’ve lost your job, be grateful for any support you may be getting. And if you aren’t getting any support, be grateful that you aren’t a quadriplegic. And if you are a quadriplegic, be grateful for the friends and family relationships you have. It’s important to find - and focus on - anything that makes you feel grateful; which is possible no matter how bad things may seem at the moment. Think of the people like Randy Pausch – the professor who died recently of pancreatic cancer, leaving behind a wife he adored and three young children. Think about W. Mitchell, the survivor of two near-fatal accidents, who is terribly disfigured and remains happy, productive, and successful. I could go on and on about the many people who most of us know about who have lived through tremendous adversity, yet remain positive and grateful for what they have in their lives. Yes, there are many people who have it much worse than you and I - no matter what your circumstances are right now. Everything is relative. And there is so much to appreciate, if we focus on the right things. So in this section of the newsletter, I’ll provide some simple exercises for the next two months (until the next edition of the newsletter) which will relate to the main "subject" of this edition of the newsletter and help make happiness a habit. For the next 60 days, don’t watch the news. Don’t even read the newspaper. In fact, if you’re really committed to happiness, don’t watch TV at all. Take a break from the media “hype”. I know this will be tough for some. But come on – it’s just 60 days. You can go right back to focusing on the negatives provided constantly by the news media in 2 months (or maybe not). Basically, though, it involves spending just 15-30 minutes everyday (or longer if you want) going through 3 positive things that happened to you throughout the day. Ideally, this exercise is best done with someone else (like your spouse, roommate, sibling, parents, etc.). You share your positive experiences with them and they share theirs with you. YOU MUST do this everyday, though, for it to have an effect. Like I said earlier, it must become a habit. And sometimes it’s not easy to come up with 3 positive things from your day – or even to feel like doing the exercise at all. Do it anyway! Again, we’re just talking about 60 days here. Write down this list and add to it. Make it yours. Feel the emotions associated with the things you have on your Gratitude List. Enjoy the appreciation you feel by just writing it down (I know I did by just doing it here in this newsletter). Then, put it up somewhere; maybe on your refrigerator or on your computer’s screensaver. Put it on your desk at the office or in your home. And LOOK AT IT everyday. Use it to spark your thinking for your Three Great Things Exercise at the end of every day. Use the tools found at BeHappy101.com to help you in all areas of your life. For now (and for this next 60-day period) just get this process started by doing some of these basic things to help you be more grateful for what you have – and not focus on what’s missing or wrong. Do this for the next 60 days. Make it a habit. It will change your life. Notes from the Desk of The Neighborhood Shrink: This is a new “clinical” contributor to behappy101.com. Eugene “Chip” Weiner is a clinical psychologist and close personal friend. He provides weekly contributions to behappy101.com on relationships, happiness, mental health, and much more. PART THREE of an effective new goal-setting process for establishing and achieving goals.